We are sure you are going to have plenty of questions to ask about booking the Ritz Trio for your wedding. We look forward to discussing these with you in person, however below are some of the most frequently asked questions. This varies on each event but normally between 2 hrs for drinks receptions up to around 3 hours. We are always happy to discuss this with you in order for your own requirements to be covered. What sort of jazz do they play? The band’s repertoire is especially selected for each event but generally the songs are well known jazz standards: “Fly Me To The Moon”, “Have You Met Miss Jones” and “Autumn Leaves”. If you have any particular favourites, please let us know. 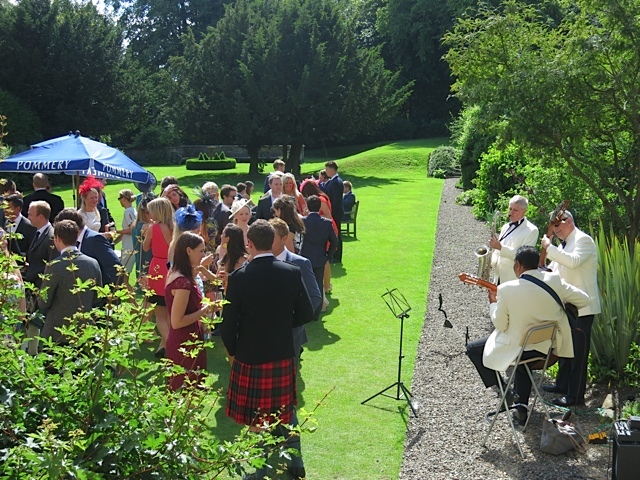 The band play at a level which will enable your guests to talk to each other comfortably. When the Trio play on the Royal Yacht Britannia guests are often seated only a few feet from the band and are able to enjoy their evening together as well as the music. If the band are required for dancing the level can be taken up but will still be at an acceptable level. Can the band play during my wedding ceremony? Yes, the band are happy to play at wedding ceremonies and select appropriate pieces in liaison with the bride and groom. The guitarist in the band also performs solo guitar which can be very effective during a ceremony. Does the band have a singer? Yes, the band does have a singer who joins them as and when required. The band can also be increased to a six piece by adding keyboards, drums and another brass instrument. The group also play as part of a larger nine piece big band. The Ritz Trio is made up of professional musicians who have very many years of experience. They are all very guest-friendly and enjoy their music and previous testimonials have shown the guests not only remember the high quality of music performed but also the friendliness of the band members. Whilst individual musicians pictured here may not attend every event, you can be assured that the same standards are maintained in both the quality of the music and their appearance. The band normally requires about 2×3 metres for the trio (but have played in smaller places! ).